Back last Fall, my aunt was driving to our place and spotted an old ladder in someone’s trash. We get a lot of things from other people’s trash. Mostly old windows. My family has a thing for old windows. I could do a whole post on old window ideas but this post is about old ladders so you’ll just have to daydream about those other things. Steve would like me to point out that we don’t “rummage through peoples’ garbage,” rather if we see something antique that catches our eye, we stop to get it. So Steve, my aunt and I drove back and picked up the ladder and then chopped it in half so that we’d each have an awesome old ladder to use to our hearts’ content! I had no idea what I was going to do with mine at the time, but I knew I’d figure something out. Steve looked at that 13 foot ladder and didn’t bat an eye. He’s gotten used to picking things up from other peoples’ garbage for no other reason than it could be useful someday. I was over-the-moon when he spotted and pointed out his first find – two giant yellow old windows. Those are still in our garage. I got my ladder project idea from this Etsy store. 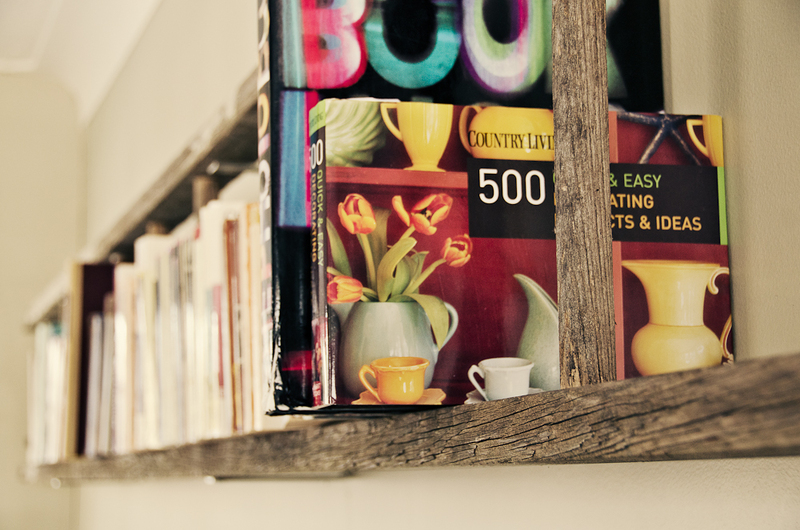 You take an old ladder that you have kicking around, hang it on your wall, et voilà, it becomes a funky shelf! Step 2. Find your studs. This is where you might need some patience, especially if your house is old like ours. Instead of drywall we have thick plaster and lathe, and behind that hide our studs. Armed with the knowledge that in general, studs are about 16 or 24 inches apart, and with help from the stud finder, you should be able to get a ball park range of where the studs are. When you drill, you should feel some resistance. That’s how you’ll know you’ve found the stud. We ended up with 37 holes. There should only have been 18 🙂 I have a very patient husband, but he was cursing that ladder in his head, I know it. Step 3. Screw your brackets to the wall. Measure many times throughout this process, holding the ladder up to check your progress. We had to tweak one of the bracket sets because it was quite off, either because the ladder wasn’t perfectly straight, or because we just measured wrong the first bunch of times. Step 4. 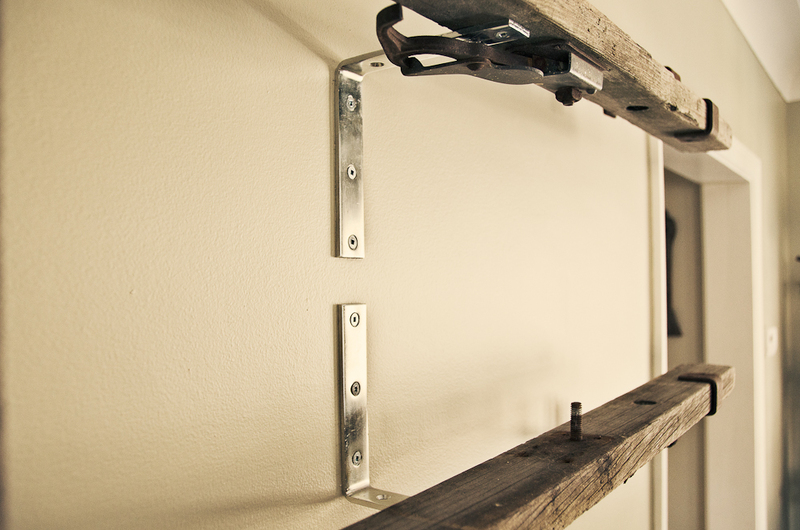 Place your ladder between the brackets and screw it in place. At this point, it’d be a good idea to leave the project for 24 hours and make sure it’s solidly in the studs. If you wake up the next morning and there are cracks in your walls, you’ll know something’s not right! 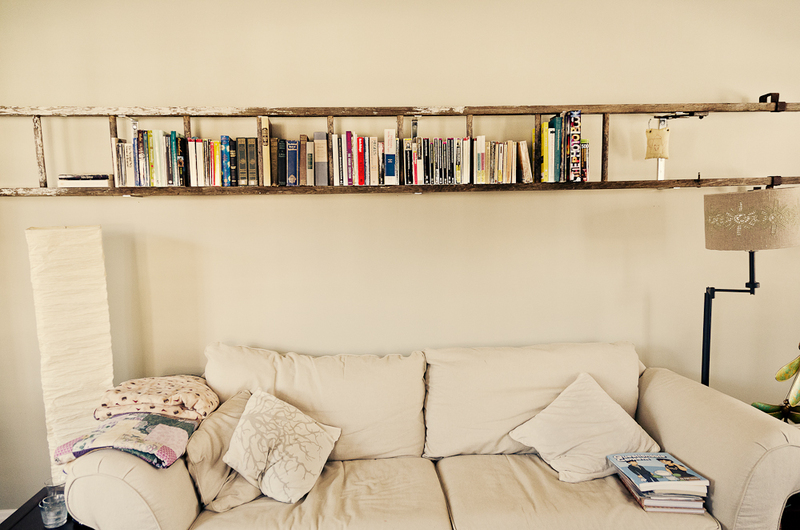 We wanted to be super sure this shelf was going to hold because we’d be placing a lot of books on it and it hangs above our precious heads, above our couch. Step 5. 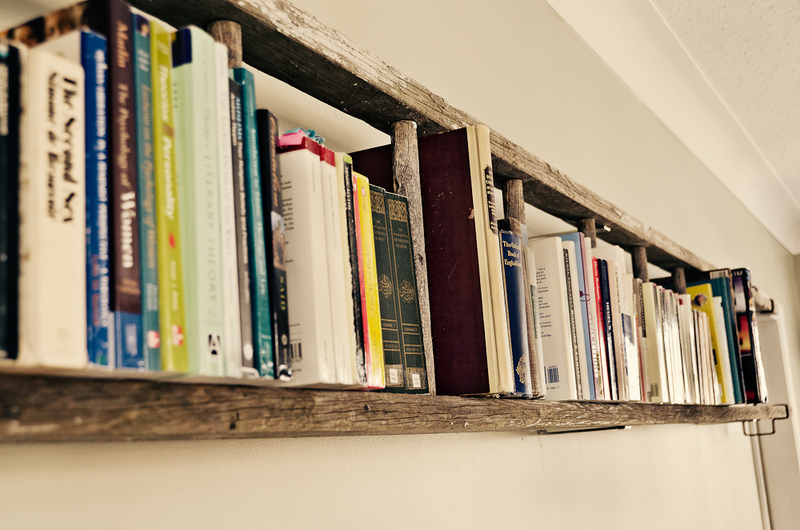 Start using your shelf! It looks fabulous holding just books but I think I’m going to place some of the book groupings horizontally and then add knick-knacks and other things I want to display. Let me know if you have any questions. I’ll do my best to answer them, but admittedly I’ll likely just go running to Steve and ask him! *If you have money to throw around and you don’t feel like waiting around to find an old ladder, you can purchase a ladder with brackets and hanging instructions from this Etsy store.